The following article, written by attorneys Michael Hollander and Rebecca Vallas, ran in the Legal Intelligencer on Monday, January 24, 2011. The text of the article appears below and a PDF of the article can be seen here: 1/24/2011 Legal Intelligencer Article on CLS’s Work to Ease the Burden of the Recession. Lately, everywhere we turn it seems there are reports of the improving economic outlook. Unemployment dropped in December from 9.8 percent to 9.4 percent while over 100,000 jobs were created; the stock market is back to levels not seen since before the crash; and the manufacturing sector grew for the seventeenth month in a row. The short-hand way to refer to the current recession is “the Great Recession” or “the worst recession since the great depression.” We’ve all heard about staggering job losses, an unemployment rate about 9% throughout much of the state and country, and 99ers losing their unemployment benefits without ever finding a job again. At the same time, recent news has focused on the few bright spots in the county, including a slight lowering of the state unemployment rate and fewer people seeking jobless benefits each month. Without some hard figures, it is difficult to tell where the economy stands. Even with hard numbers, such as a falling state unemployment rate, it is difficult to tell how well we are doing compared to “normal.” We may be improved from eight months ago, but that doesn’t mean we are out of the woods yet. The amazing folks at the Calculated Risk Blog have put together a series of graphs showing just how bad things are (and whether they might be improving). Below is a gallery of some of the most telling, with some commentary. 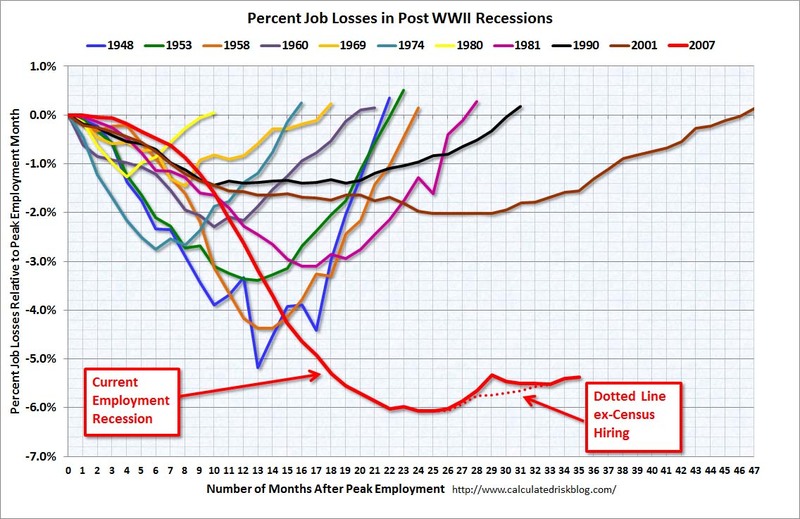 First, we have a graph showing the percent of job losses in all recessions since WWII. Most evident in this chart is that we’ve fallen deeper than previous recesssions and have recovered more slowly than any other recession (with the exception of the relatively mild 2001 recession which took a very long time to return to pre-recession job levels). You are currently browsing the Community Legal Services Blog blog archives for January, 2011.